Nicole Richie is stepping up her game in the designing world and she is going way up with fine diamonds and sapphires.
" Do you ever wish you could turn your favorite piece of costume jewelry into real gold? Peppered with real diamonds or sprinkled with rubies and sapphires instead of Swarovski crystals? If yes, Nicole Richie’s heard your prayers. When Richie ventured into the world of design she started with a jewelry collection under the label House of Harlow 1960. Since then she’s announced plans for a fragrance and kid’s wear and debuted Winter Kate, a range of sort-of-hippie-but-still-chic clothes often spotted in Hollywood and Manhattan alike. Now, she’s adding fine jewelry to her resume. Richie’s taking signature HOH pieces and remaking them in fine materials. She wore one, the sunburst ring, to the Met gala on Monday night. The sunburst holds a natural grey diamond slice in an asymmetrical micro pave setting. 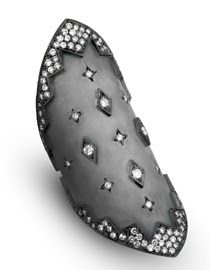 Other styles, like the long, knuckle covering ring, use black rhodium to plate the gold and the diamonds. The one off pieces will be available to purchase by special request, and run upward of $50,000. " What are your thoughts on Nicole's House Of Harlow jewels, I think it all sounds so exciting but I don't know how I could afford the beauties, i'm guessing they are going to shine on red carpet events!